﻿Warren has a passion for travel photography - particularly the animals, people and culture of East Africa, India and Asia. 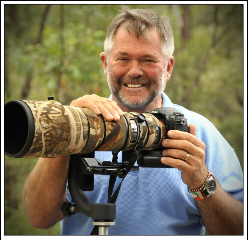 He also turns his camera to other areas of photography and never ceases to draw inspiration from the environment and wildlife of the Jervis Bay (NSW Australia) area where he lives on a bushland property with his wife Yolande, greyhound Ricky and chickens Nutmeg & Cinamon. Warren has headlined solo exhibitions at venues on the NSW South Coast and in Sydney as well as participating in many group exhibitions. His work has been featured at the Shoalhaven Regional Art Gallery, Manly Art Gallery, Art House Hotel - Sydney and Jervis Bay Maritime Museum - Huskisson. Warren is represented by the Milk Factory Gallery, Bowral NSW. Warren has won international and local photographic competitions and his work is held in corporate and private collections in Australia, Asia and Europe. Warren's images have featured in newspapers, magazines, calendars, children's books and in many photographic festivals.